Principal Cast : Christian Bale, Joel Edgerton, John Turturro, Aaron Paul, Ben Mendelsohn, Ben Kingsley, Sigourney Weaver, Maria Valverde, Indira Varma, Hiam Abbass, Kevork Malikyan, Anton Alexander. Synopsis: The Biblical tale of Moses leading the Hebrews out of slavery in Egypt, across the Red Sea and to freedom. What we think : Although it seems to abscond with avoiding a lot of the faith-centered teachings of Moses’ exodus story, Gods & Kings certainly makes up for it in ambition. Sadly, at the end of the day, ambition doesn’t amount to much if the central thrust of the movie lacks impact. Hard as it might seem to believe, but master storyteller Ridley Scott gives us a rambling, uneven, often lethargic voyage into 2014’s second biblical outing, a visually stunning yet narratively inert take on the famous story. At the end of the day, can’t we all just get along? 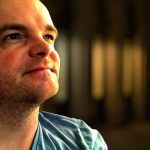 Biblical epics seemed to be the order of the day in 2014 – the stories of both the Exodus, and Noah’s Ark, were given blockbuster status by two renowned directors. Noah, helmed by Darren Aaronofsky, was met with mumbled indifference and wholesale avoidance in some parts. Exodus, assuming its rather portentous subtitle Gods & Kings, is the attempt by master visualist Ridley Scott, whose allure has waned in the last several years (*cough*Prometheus*cough*), to bring the story of Moses leading the slaves out of Egypt to life; it’s been done before, notably with Charlton Heston’s The Ten Commandments, as well as a Dreamworks animated film, The Prince Of Egypt, enshrining the famous Biblical story for all generations. So what makes this version of the Exodus story different? Or better? Or worse? Ridley Scott’s batting a solid average for period epics. Gladiator, his millennial film about a betrayed Roman commander who ends up fighting it out in the Coliseum, garnered the Academy Award for Best Picture of 2000. His next film in the genre, Kingdom of Heaven, was met with critical ablutions during its theatrical run, but managed to scrape back almost all its credibility once folks saw the Director’s Cut. Exodus, which takes us back even further in time, sees Moses (Christian Bale), stand against his brother, Ramesses II (Joel Edgerton), as two adopted brothers squaring off over the future of Ancient Egypt. The film also stars Aaron Paul as Joshua (one of Moses’ assistants), Ben Kingsley as Nun (father of Joshua), a brief cameo by John Tuturro as Ramesses’ Pharaoh father, Seti I, and Sigourney Weaver, of all people, as Tuya, Ramesses’ mother. Leaving aside, for a moment, the interpretation of one of Christianity’s most enduring non-Jesus stories, Exodus is a stand-up sword-and-sandal epic in the genuine tradition. As is his wont, Ridley Scott’s visual acuity in giving the film a lavish, breathtakingly widescreen scope is as on-point here as it was in Gladiator or Kingdom of Heaven. The film looks marvelous, dirty and crisp, filled with dazzling imagery of the kind Scott has delivered before, and certainly giving audiences one of the more authentic depictions of this era in history as we’ve seen to date. No, this isn’t some cut-rate television production, this is a full-fledged studio effort, and as usual, Scott’s use of his budget (rumored to be $140 million) provides for a lavish and detailed landscape on which to plant his characters. Speaking of the characters, they seem to have that square-jawed action-movie vibe going on, which detracts from the more faith-centered teachings of the biblical story. Allowing Ridley Scott a moment of creative license is one thing, but you get the sense during this film that he’s trying to adrenalise the story more than it perhaps warrants. 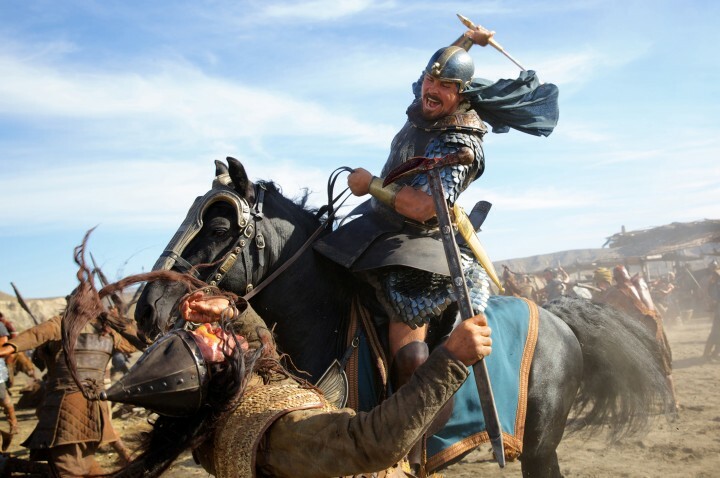 Action on this scale needs a pivotal human focus; for Gladiator, it was Russell Crowe’s Maximus, and with Kingdom Of Heaven it was Orlando Bloom’s Balian, and both those films had heroes of flawed and divisive natures. So too is Moses, at least as depicted here. Bale imbues Moses with an underlying ferocity seemingly at odds with what I learned in Sunday School, and while it’s an interesting take on the character, in my opinion it removes a lot of his empathy and humanity whilst dealing with his relationship with Edgerton’s Ramesses. 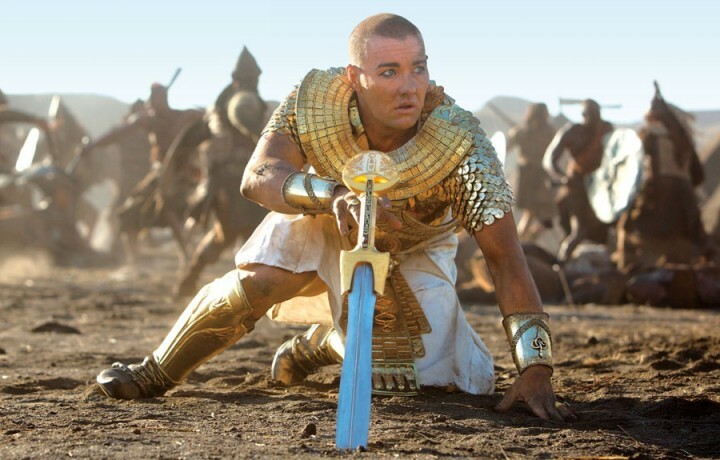 Edgerton, meanwhile, flip-flops Ramesses between pragmatic brother and outright camp villain. This is less his fault than it is a direction of the script, which seems too hurried to get to the antagonistic side of his relationship with Moses and leaves the build-up to this schism aside in favor of dramatic fireworks. The rest of the roster feels a little like stunt-casting. Ben Kingsley’s allure as an actor seems predicated on him playing some variant on his Schindler’s List character (Iron Man 3 aside), and once more he’s got that glint-in-his-eye mischievousness as Nun, who stokes the fires of doubt in Moses early. Kingsley is a better actor than this film deserved. Sigourney Weaver is utterly wasted, Aaron Paul disappears for entire hours at a time, and even Ben Mendelsohn, as Hegep, lacks conviction. Oh, and points for anyone who spots Ewen Bremner in this. 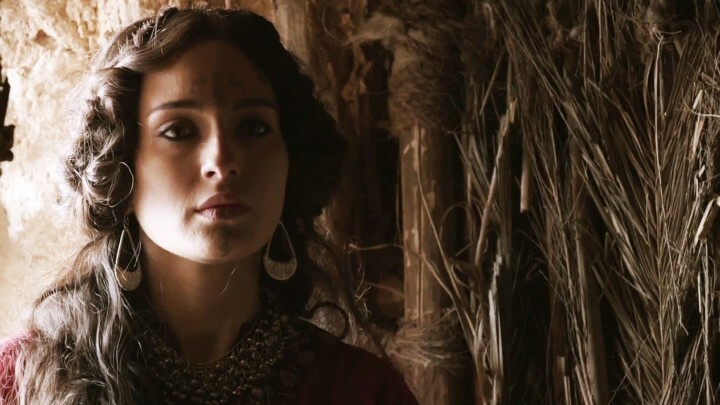 Hard to fathom how a Scottish accent appears in ancient Egypt, really. 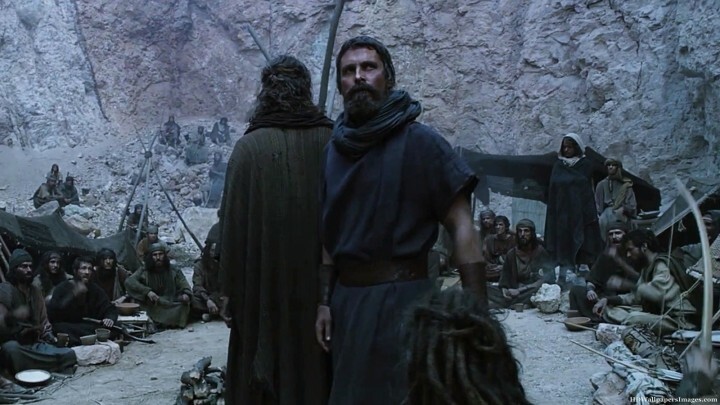 Kevork Malikyan, who played the ill-fated Kazim in Indiana Jones & The Last Crusade, is glimpsed among the horde, and Spaniard Maria Valverde makes a good fist of being Middle-eastern as Moses’ wife, Zipporah. 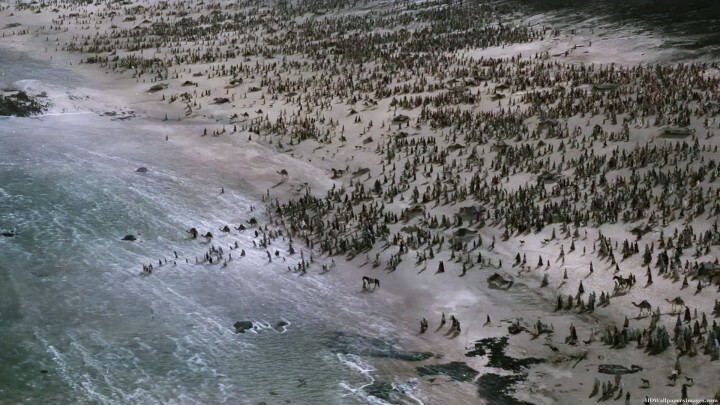 While the film hangs its budget primarily on the sumptuous visual escapades of Moses’ plagues, and the eventual flight of the Hebrews across the Red Sea (yes, the parting of the Sea is especially awe-inspiring, and alone probably worth the price of admission, if not the trudge through the lengthy dramatic quicksand of a Hollywoodized Bible play-by-play), Exodus comes undone through its decidedly lackluster treatment of Moses and Ramesses relationship. Part of the appeal of Prince Of Egypt was the dynamic byplay and one-upmanship entertained by both characters – a test of wills, of nerve, irrespective of interjections by God. Exodus cannot muster a similar appeal, relying on Bale’s angry, full-blast portrayal of one of the Bible’s most revered figures. Intensity is all well and good when things call for it, but as it has served him well in the past, so it seems to keep Bale on the edge of apoplexy most of the time; voluminous acting aside, Bale is watchable, but hardly memorable. Truthfully, I think the part too ill-written and deviating from the text to do him justice. Exodus lurches between reverent spectacle and flash-bang action theatrics that detract from the story. As unbalanced as Kingdom Of Heaven’s theatrical cut was, at least Scott made a point of making the violence make a point. Here, the unrestricted PG-rated bloodshed (while most definitely accurate to both history and Biblical teaching) doesn’t seem to have the same impact it should, becoming a mindless role-play burden the film wades through to continue with the character stuff. Explosions of flame and God-power are all spectacularly rendered, but feel like a jumble against the low-key elements of the story’s familiar beats. As much as the script (scribed by no less than four people, which probably goes a long way to explain this film’s sense of piecemeal jigsaw tone) tries to give us weight between Moses and Ramesses, there’s too much perfunctory pontificating about stuff that hasn’t been earned by either character, and as a result, every moment of dialogue – while expertly delivered, sure – clunks to the floor. If I may be so bold, and I hate to second-guess a director of Ridley Scott’s caliber, but I think part of the problem if that Exodus tries to be a relatable film to modern audiences, without making the central characters relatable at all. If you’re going to go the “realistic” route in your depiction of a story such as this, one known and loved the world over, you need to make sure audiences “get” into the headspace of the lead character – in this case, Moses. Unfortunately, Moses comes across as either a bit of a douche, a prick, or infuriatingly arrogant. The fact the film find him arguing with God (in the form of an urchin) on the side of a mountain like a petulant child (whether it’s accurate or not, I’m not sure) makes us resistant to liking him – or at the very least empathizing with him – and this hamstrings much of the film’s purpose thereafter. Frankly, if you’re going to see Exodus: Gods And Kings for any reason, skip the ponderous acting and skip through to the admittedly impressive action set-pieces. The plagues upon Egypt are superbly rendered and brutal as hell (the Passover is a particular highlight). The escape from Egypt by the Hebrews, led by Moses, is equally as sublime, a mixture of live action and CG hocus-pocus that delivers the requite shock-and-awe on a scale only Big Hollywood can bring. It’s a shame Exodus isn’t a better movie in terms of character, or even emotional wallop (the Bible story deserved better, to be honest), but as a piece of fictional dramatics liberally scraping the good stuff from the biblical story, there’s momentary glimpses of genuine greatness amidst the drudgery. Agree that the characters could have had more depth, but quite enjoyed the spectacle of it all and the naturalistic approach to the story. By trying to "realistically" portray a story that's grounded in faith, Ridley Scott attempted to portray the impossible. 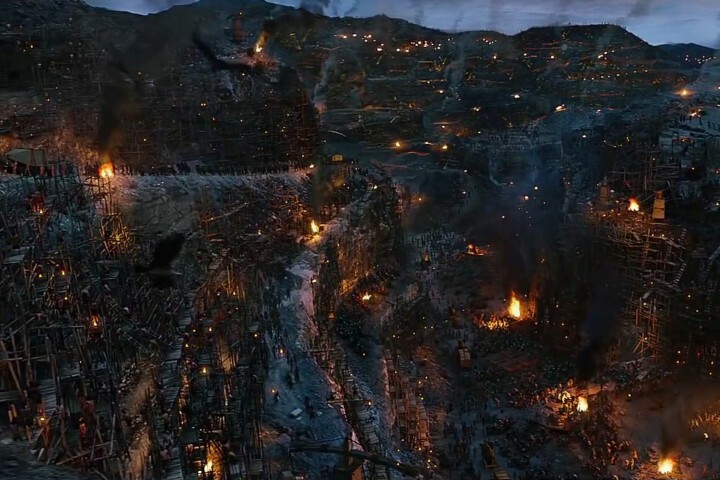 Still, I did enjoy the nice pictures and great special effects.